*For preserving natural wood appearance stain shouldn’t be applied. - Which floors can be refinished? All prefinished and unfinished solid wood floors as well as some engineered hardwood flooring can be refinished. 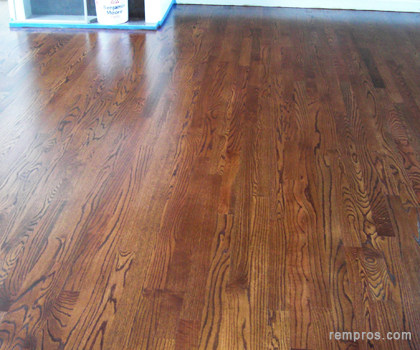 - How many times hardwood floor can be refinished? The numbers of time hardwood floors can be refinished depend on the thickness of top wearing layer. Usually 3/4” solid unfinished wood flooring with 5/16” top layer can be easily sanded a few times. But some engineered hardwood with 1/16 (1.6 mm) or thinner wearing layer will be impossible to sand even one time. Wood floors have to be fixed prior to start on refinishing process. All damaged planks have to be replaces and squeaks eliminated. Shoe base and all baseboards should be removed. The whole floor has to be cleaned. Using sanding machine, also known as a drum or belt sander with 60 grid sand paper, eliminate deeper scratches and primary remove all finish from the hardwood floor surface. Fill all gaps and holes in the flooring using wood filler. Sand two more times using 80 and 100 grid sand papers. Use wood floor edger for sanding edger and hard to reach areas like closets. After essential sanding done vacuum all possible dust and using buffer with a very fine sand paper make surface smooth and free of all marks might be left after belt sander. Vacuum the floor and slightly apply water or better wood floor conditioner to stimulate opening wood pores. Mix desire color of a stain. Apply stain manually or with a buffer. Let the it dry according to manufacturer instructions. Using roller and brush apply water or oil based finish as a protective wearing layer. After first coat dry - buff the floor, vacuum all dust and apply 2 – 3 more coats of finish. Baseboards and shoe base molding installation in a final step of completing the whole refinishing process. - Some finishes are very hard to eliminate from prefinished hardwood flooring and it might take longer complete sanding out top layer. - Most prefinished solid and engineered wood flooring planks have beveled edges and while sanding the floor more wood has to be taken out to make the surface of whole flooring smooth. - While operating sanding machine always keep it moving – do not stop while the drum or belt rotating. - Always test the stain color on a piece of wood before application. - Always read manufacturer instructions and specifications for stains and wood floor finishes because each product has its unique properties and require adequate application methods.